Home Have a Cuppa Happy New Year everyone! I would like to wish my readers a Happy New Year. I hope you and yours had a wonderful holiday season and with the new year underway I hope you have set about achieving some of your personal goals I have but more about those later. For those who are continuing or starting TAST this year I plan to restart Take a stitch Tuesday on Tuesday the 24th of January. Next Week in other words. This year is a special year for TAST as this challenge first started in January 2007 which means it has been running for a decade. Having anything online over a period of 10 years is quite amazing. I can honestly say I am quite surprised at how popular it still is. I became really excited when I realised that this year was its 10th birthday and gave some thought about what I could do to highlight this rather special anniversary. Many people have said TAST has taught them to stitch and I would love to hear your story.There are also many very creative embroiderers who have taken up the challenge. Throughout the year I would like to interview and feature the work of stitchers who have participated in TAST. So emails have been flying, facebook messages sent and there has been quite a bit of activity behind the scenes as I have been preparing this series. If you would like to tell your story – and be interviewed don’t hesitate to email me via the contact page. I am also still working on a series of questions for the interviews. Do you have any questions you would like to ask TAST participants? Let me know in the comments below. For those readers who are new to TAST, the challenge is for all stitchers at any level of skill. The idea behind the TAST stitchers challenge is to learn a stitch a week if you are new to embroidery or if you are an experienced embroiderer work a stitch a week and push it in creative manner and key is to share a photo on social media or a blog so that new hands to embroidery can see what can be done with a little imagination. The way it works is that I propose a stitch and link it to a tutorial online, then people work a sample on anything they choose, it can be a work in progress or a sampler its up to you then put the photo online on your blog,flickr or share it on facebook or where ever you hang out online. Hashtags are #TASTembroidery and #PintangleTAST on places like Instagram etc. The challenge guidelines are on the TAST FAQ page. Every time I open a social media channel I see that stitchers are grabbing hold of the idea to stitch every day. In a normal week I do usually stitch daily – even if it’s only few stitches over the evening news. It is one of the reasons I have managed to stitch so much over the years. But lately I have felt a little stale so I decided that this year I would join in on a few stitchers challenges. These challenges were inspired by Hannah Claire Somerville’s Year of Stitches project which my readers might enjoy ( I found the post a photo a day idea a task I would not keep up with, and did not want to abide by the colour sequence, so have not joined it but it looks a good challenge) You can check out the details here. 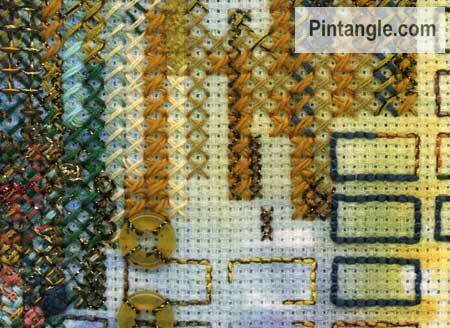 Pam Kellog of Kitty and Me Designs is running stitch along called the Never Ending Sampler Stitch Along. Pam has been posting free designs each week and people are stitching along and sharing their progress on in the Never Ending Sampler Stitch-Along Facebook group. The rules are very flexible and the sort of challenge I like as it becomes a real proposition to do it. I find often the first of second month of doing something is Ok but continuing is sometimes hard. Life gets in the way and it all falls in a heap so I like flexible challenges. With this one There are no rules, no time frame, work in any colour or with any thread you choose, and participation is free. You can work at your own pace, skip when life gets busy or if a band does not take your fancy then it’s OK to skip. Pam is working in panels that are 6 inches wide recommending that people use 14 count Aida or 28 count evenweave over 2 fabric threads. Regular readers will know that my band sampler is 6 inches wide. I have always wanted to add more of the patterns I discover online to my band sampler. I never seem to get around to doing it so this is just the poke I need to do it. I plan to start with some of Pams designs and her rules are flexible enough to allow me to intersperse some of Pam Kellog’s patterns with my own designs and experiments on my own band sampler. I have got as far as sorting out some fabric (hey! I am dealing with a husband who is recently retired who wont keep still for long!) The designs are really nice – check them out here. What is coming up next Year? 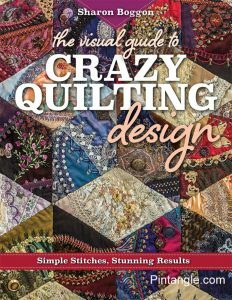 Also coming up this year is my book The Visual Guide to Crazy Quilting Design will be out mid year. It is currently in the hands of the publisher. This stage of the process is exciting for me as the work has been done and every now and then I open my mail to see things like the cover design or last week I had a look at some of the page layouts for the book. So far I really like the look and feel and love what C&T (my publisher) are doing with it. I have no idea how to convey to readers how thrilling this process is once the book is handed to a publisher. In other words after I have done the work of writing and photographing and I have forgotten how much work it was! I am excited I am about this and will obviously keep readers posted about progress. My stitchers templates that are designed for crazy quilters are available. With them you are able to create hundreds of different hand embroidery patterns and take your stitching to the next level.There is a free ebook to illustrate how each set of templates can be used, I have a free ebook of patterns to accompany each set. Using the shapes found on the edge of each stencil you can create numerous seam embellishments. These templates are made of clear plastic so you can position them easily. To use them position the template in place and, holding it firmly with one hand, so that it does not shift, use a quilter’s pencil to trace along the edge of the template to create a pattern. Stitch along this line to decorate the seam. For those interested in seeing photos and hearing tales from our travels, Jerry is currently writing these up on his blog The Fogwatch. If you are interested make a cuppa and settle in as documenting an 800 km walk (500 miles) across Spain, takes a little time to tell. It was an amazing life changing experience that we are already training and saving in order to do it all again! Wipes brow … I think that is all Oh! and happy New Year! I’m doing one of the Stitch a Day projects and I am using the TAST archive to choose at least one of the stitches I use each week. I use your stitch dictionary often and will be referring my new beginner stitchers to it this year. Also using the templates for designing shapes for them to stitch. Thank you Sharon and happy New Year to you too. I am also planning to sew a little each day – some stitching I would like to catch up on and some hand patchwork. Your generosity has enabled me to explore so many lovely uses of stitches. My husband, a close friend and I completed the Camino in 2015. We too are saving to do it all again – we have 2018 in our sights. Wow! What an exciting post. You’re an inspiration Sharon! Smiles and joy to you in this lovely brand new year of stitching and joyful colors…. looking forward to my first year of TAST. Happy New Year and Congratulations for 10 years of success AND the publishing of your book. I took your online courses and learned a wealth of things. I love your art and enjoy your weekly TAST. Many a time, I have used your instructions for a new-to-me stitch. Thank you for sharing your ideas for encrusting and embellishing crazy patches. wishing you a wonderful 2017. Happy new year. You are amazing what you achieve. One of your greatest achievement is inspiring and teaching your crazy friends. Looking forward to catching up in February. Happy New Year to you too Sharon. What an amazing 2016 you have had, and I suspect your 10th anniversary year of 2017 will be adventures of a different kind. You have inspired me, I have been receiving your regular posts for a long time and have only tried a couple of stitches, now I am hunting out some aida I have stashed somewhere and will seriously begin to create some samplers. I now realise the aida will assist me to keep my stitches even in size and tension. This of course is my biggest challenge. Then who knows, a crazy patch or two would be great. Thank-you for your enthusiasm encouragement and easy to follow instructions. Happy New Year to you and yours, Sharon. Did Eve see that Ringling Bros. Circus is closing after 103 years, sad….. Thank you! Good luck with book launch! Thanks for the round up and links to the stitch alongs Sharon, I have seen references to some of these here and there, but to have them all in one spot is so handy!